Laser Calibrate the axis of your machine tool to original factory specifications. Requalify your machine to its original factory specifications with our turnkey certification. This service can be purchased separately or with any of our PM, Health Check or ProCheck Services. Do you need to know the status of a machine? Our health check program can give you a complete evaluation. 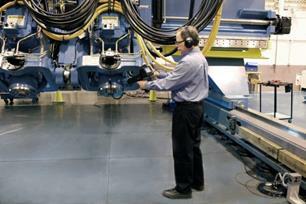 Reduce the cost of machine ownership with our Preventive Maintenance and reliability assurance program. Well replace critical, consumable parts and provide maintenance data for your records. Our resources go further with predictive and preventive maintenance programs, offering multiple plans to meet your needs. We utilize factory trained technicians to provide a professional, turnkey service. The Fives ProCheck is economical and there is minimal downtime required, so strategize to stay ahead. The ProCheck can be utilized on any machine tool and employed for inspecting equipment in most industrial settings. It's cost-effective for manufacturers of any size. Inspections can be made on any machine tool, regardless of manufacturer, and other applications such as production or assembly lines and factory support equipment.